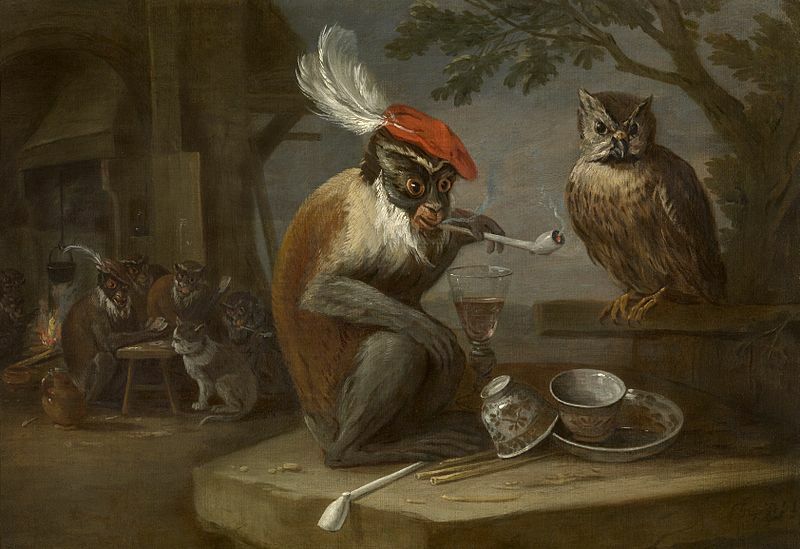 Why Are There So Many 17th Century Paintings of Monkeys Getting Drunk? One cold Friday in 1660, Samuel Pepys encountered two unpleasant surprises. "At home found all well," he wrote in his diary, "but the monkey loose, which did anger me, and so I did strike her." Later that night, a candlemaker named Will Joyce (the good-for-nothing husband of one of Pepys's cousins) stumbled in on Pepys and his aunt while "drunk, and in a talking vapouring humour of his state, and I know not what, which did vex me cruelly." Presumably, Pepys didn't resort to blows this time around. The two objects of Pepys' scorn that day, his disobedient pet monkey and his drunken cousin-in-law, were not as distant as one might think. 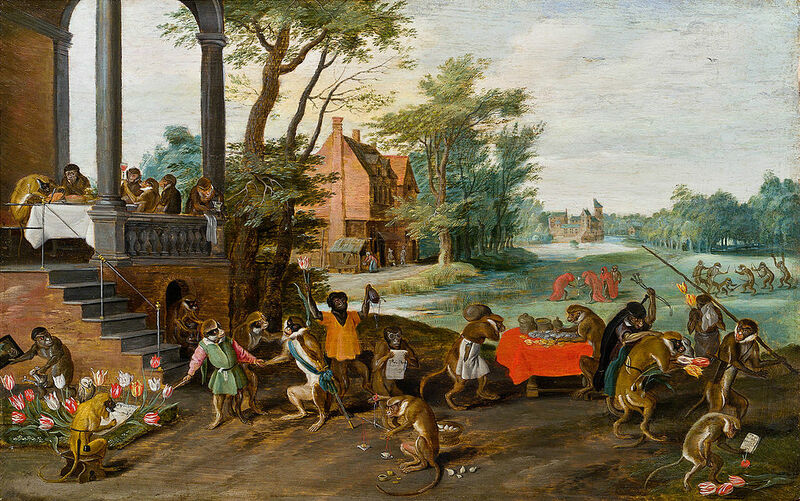 Monkeys stood in for intoxicated humans on a surprisingly frequent basis in 17th century culture. 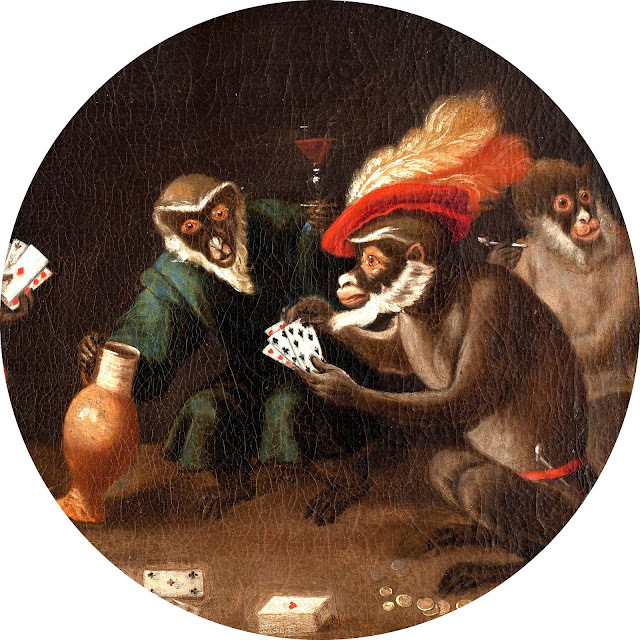 In early modern paintings, tippling primates can frequently be seen in human clothing, smoking tobacco, playing cards, rolling dice, and just plain getting wasted. 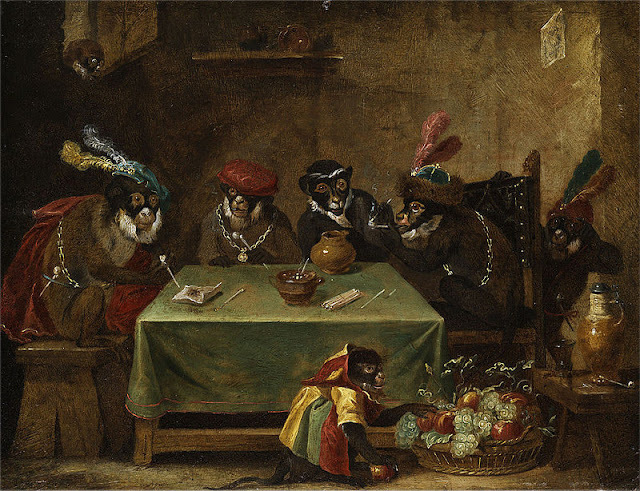 One of several "monkeys in a tavern" paintings produced by the Dutch artist David Teniers (1610-1690). The most simple answer is that these paintings are the early modern version of searching for "dog who thinks he's a human" on YouTube. They're funny. 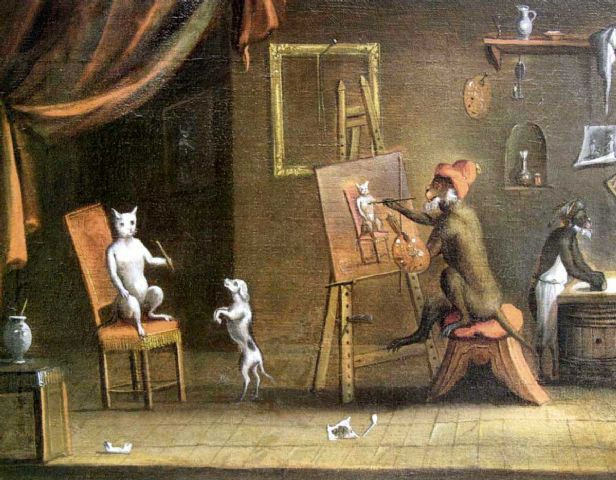 Paintings of intoxicated monkeys were actually a sub-set of a larger genre of paintings known as Singerie, which poked fun at occupations ranging from drunkard to painter by portraying the participants as frivolous simians. There's clearly something universal about the basic idea of these works. As anyone who has read Aesop's fables or a watched a Disney movie can attest, depictions of animals with human characteristics allow us to satirize or mythologize ordinary human encounters. Thinking about animals as personalities that can recite poetry, hatch political schemes, or get drunk at a tavern allows us to see our own behavior and that of our fellow humans through a slightly off-kilter filter, as if we were aliens observing a different species. 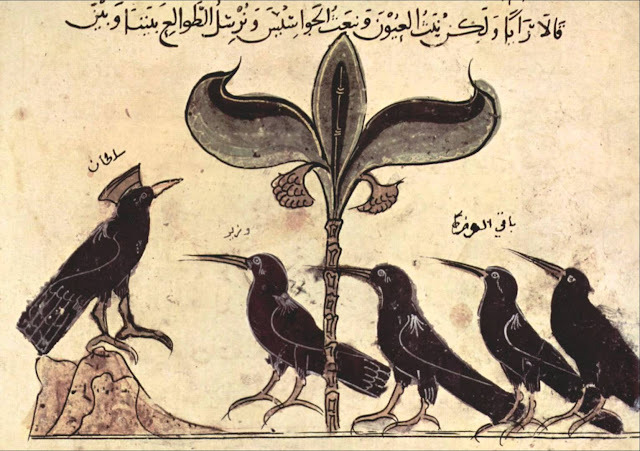 The Crow King and his Councillors, from a 13th century manuscript of Kalila wa Dimna, the Arabic version of the Pachatantra animal stories originally from India. In these 16th and 17th century European depictions of monkeys, however, I think there's something more specific going on. Monkeys in these paintings are almost always shown with a tobacco pipe or wine cup close at hand, and they’re often brandishing the same types of items displayed in a popular series of images (discussed in a previous post) showing a foolish young man being cleansed of his materialistic desires via alchemical medicine: playing cards, backgammon boards, fencing swords, ostrich feather caps. 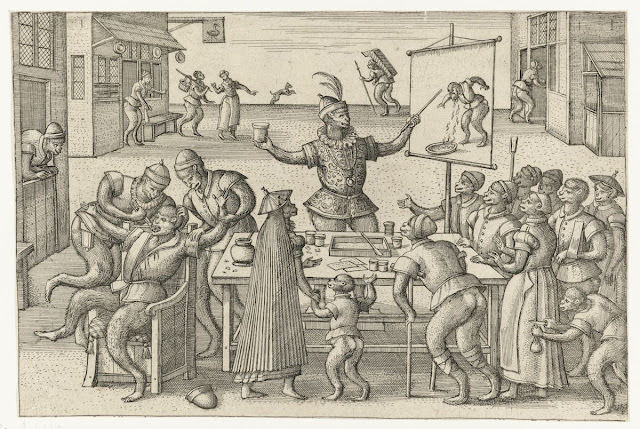 Kwakzalver [Quack] selling a patent medicine in the marketplace, by Pieter van der Borcht, ca. late 16th century. 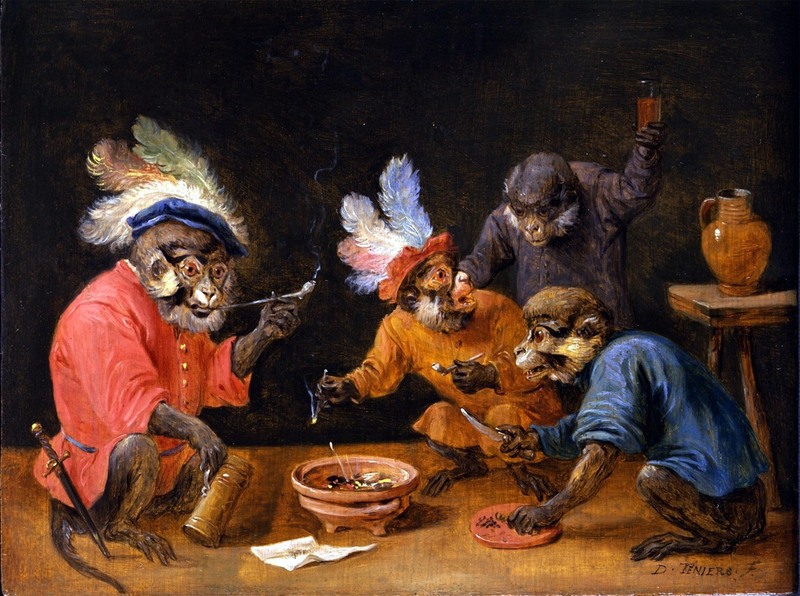 In other images, monkeys are also shown in the guise of alchemists and drug sellers, poking fun at the pretensions of these two professions that were carving out an ever-greater economic and social role for themselves as exotic drugs from the Indies became global commodities. So what is going on with these images showing drunken and drug-selling monkeys? I think that what we're missing when we simply see these as a form of social satire is that these are also paintings about addiction. Desire is a dominant theme in these works: monkeys are shown jealously squabbling over piles of tobacco, or even, in the example below, hoarding tulip flowers during the height of the Dutch tulipmania (they appear to be using the profits to get drunk, in the upper left). Allegorie der Tulipomanie [Allegory of Tulip Mania], by Jan Brueghel the Younger, 1640s. The concept of addiction had not yet taken on anything like its modern form in this period. The word existed, but it simply meant an inclination or tendency: one could be "addicted to horses" or "addicted to song," etc. But the 17th century was a world in which distilled alcoholic spirits were still a relatively new invention, and one in which such addictive substances as tobacco, coffee and opium had become available to most global consumers within living memory of the people creating and buying these paintings. In other words, these paintings are working through the idea that newly-available psychoactive substances -- and, perhaps, material objects as well -- could dehumanize those who consumed them, reducing them to an animalistic level. 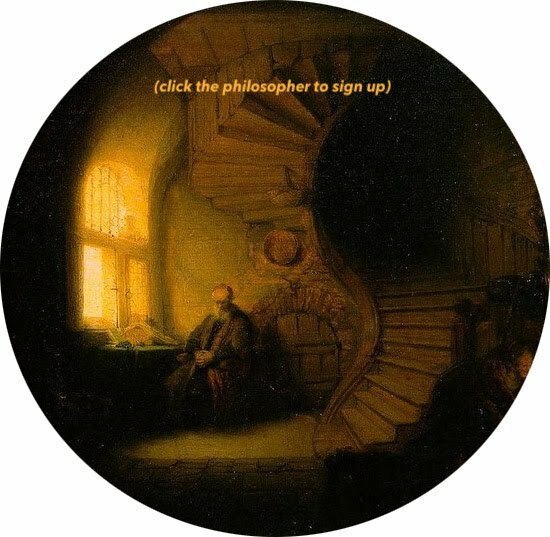 Such consumers, it is implied, had moved down a step on the chain of being, having lost their powers of reason and been reduced to creatures that were "sentient" in the original sense of the word: unable to think, and content simply to feel. 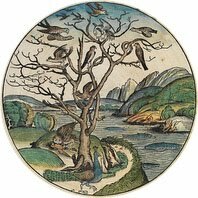 They had moved from the human realm to that of the "brute beasts" in the schema for hierarchically ordering nature that medieval and early modern thinkers had inherited from Aristotle. A depiction of the "Great Chain of Being" from a 1512 edition of Ramon Lull's De ascensu & descensu intellectus (1305). 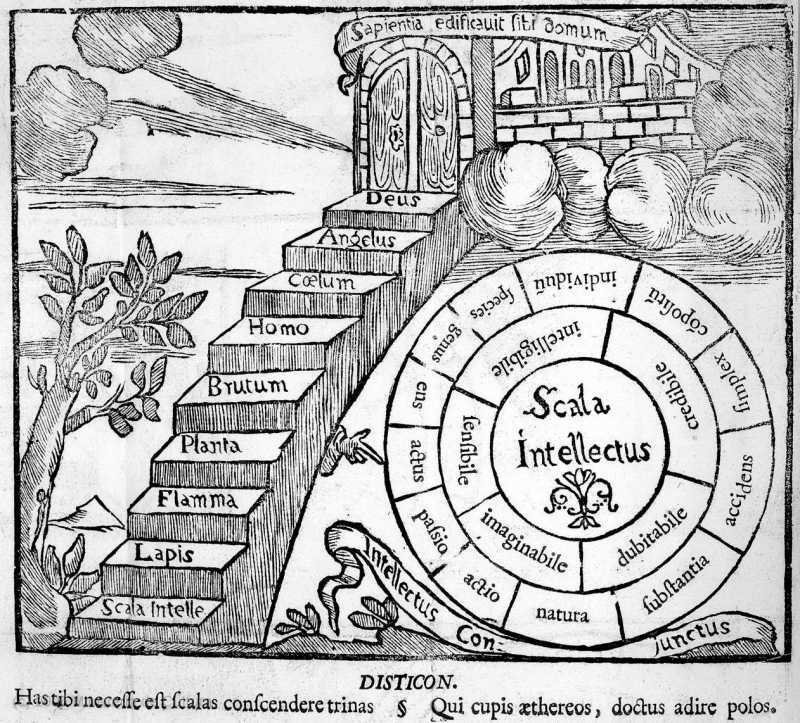 The steps are labelled, in ascending order, "Stone," "Fire," "Plant," "Brute," "Human," "Heaven," "Angel," and "God." We see this argument in some written texts of the period as well. For King James, writing in his Counterblaste to Tobacco of 1604, the fashion for imitating the foolish novelties of lands “beyond the Seas” made English tobacco smokers “like Apes, counterfeiting the manners of others, to our owne destruction.” The adoption of tobacco smoking in Europe was not simply an issue of public health, but a spiritual crisis. Because he knew that tobacco was an element in indigenous American spirituality, James believed that Europeans who consumed it risked transforming not only their bodies, but their minds and souls, too. But there's an alternative narrative running through these paintings as well. It epitomizes the ambivalence that has long surrounded intoxicating substances, in many cultures and in many times. These monkeys seem to be having fun. Die tabakrauchende Affenrunde [The Tobacco Smoking Monkeys], attributed to Ferdinand van Kessel, 17th century. Singerie with smoking pipe, David Teniers the Younger, 17th century. 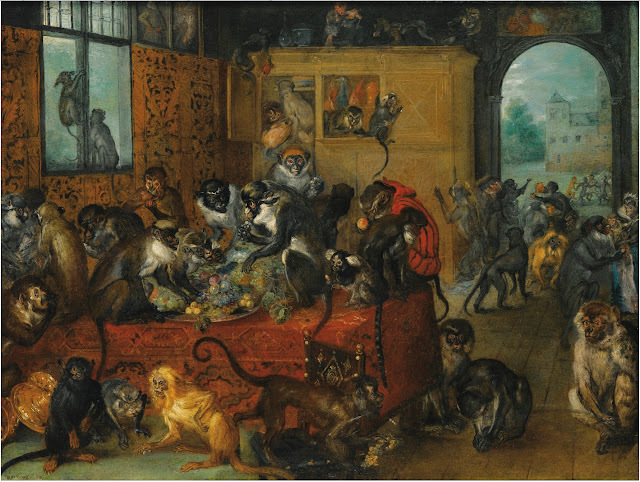 Monkeys Feasting by Breughel the Younger. 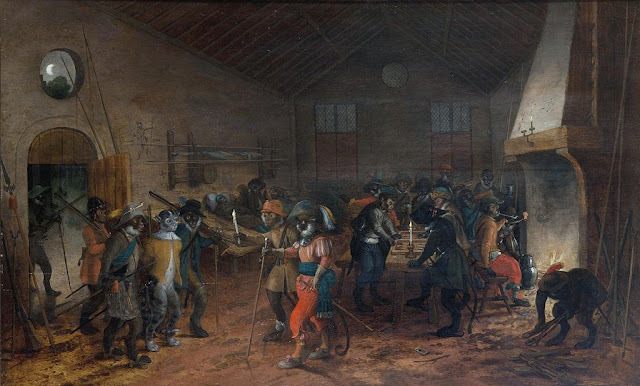 Monkey soldiers taking a cat prisoner, Sebastian Vrancx, early 17th century.